The Georgia Museum of Natural History is an important center of natural history research. For almost a century, the University of Georgia has been a center of research in natural history related to the state, the region, and the world. 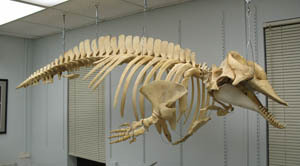 To a large extent the quality of this research is based upon the information and knowledge associated with the 11 collections affiliated with the Georgia Museum of Natural History. These collections represent research conducted in dozens of fields of study. They are crucial for graduate research and training programs in their respective academic departments. Each year the personnel associated with these collections generate approximately 100 scientific publications and average over $1,500,000 in contracts and grants. The collections themselves represent voucher specimens for the research and the data associated with each of the collections contains an important base for future research. When Wesley Huffmaster spotted a big, brightly colored and boldly patterned spider near his home in Colbert last fall, he knew it was unusual. A Whale of a Task! Each semester, the faculty, staff, and students of the Georgia Museum of Natural History welcome undergraduates as Natural History Interns to enjoy a hands-on course with the Museum. Interns receive supervised experiential learning working directly with the faculty, staff, and other students curating one of the natural history collections affiliated with the Georgia Museum of Natural History or with education and outreach programs. Learn more about the Museum of Natural History's internship program!